As outlined earlier this week, Marines in Afghanistan have a new commander, Maj. Gen. John Toolan. He has taken command from Maj. Gen. Richard Mills, who led troops in Regional Command-Southwest for nearly a year. Marine Corps Times news editor Tony Lombardo pointed out this photo to me earlier this week. 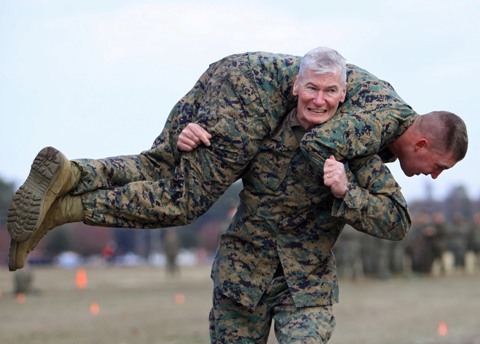 It shows Toolan during a Combat Fitness Test carrying Sgt. Michael Taggart, the noncommissioned officer in charge of II Marine Expeditionary Force’s special security office. It was taken Dec. 10 at Camp Lejeune, N.C., before II MEF (Forward) Marines deployed to Afghanistan’s Helmand province. Toolan has been in the Corps for nearly 34 years. Y’know, just for anyone complaining about the CFT. Semper Fi, one of the Corps best and still going strong. AFG better watch out. You were my series CO. for plt. 1032 MCRD San Diego 1980. I’d be your SGT Maj. except I took one too many in Panama. It is so good to see the leaders leading by example. My nephew is under this man’s command. Does a worried heart good to see pictures like this. Frickin’ Awesome to see our senior leadership setting the example! i met gen. toolan when he was a new butter-bar and asst series commander while i was on the drill field (1st bn, mcrdsd). sure is different to see him with the gray, but it’s great to see that his youthful spirit has not diminished. Maj. Gen. Toolan was my Battalion commander when I was a Marine with the 3rd LAI Bn. He is the finest officer i have ever served with in my 24 years in the service. I am pleased that my brothers in the Corps are in good hands, and will be led to ultimate victory! Semper FI!! !